There's lots of public beaches on Camano and Whidbey. The yellow beach areas on the below map are public beaches. Somehow, almost all of Penn Cove at Whidbey became a public beach area. this is a link to a long 2006 washington state pdf legal paper about the public trust doctrine. The below map is from http://www.wdfw.wa.gov/fish/shelfish/beachreg/map08.htm If you click and go to that Washington Dept Fisheries & Wildlife "map08", there are clickable links to/about all the yellow public beach areas. I've been walking the Camano Beaches for decades, and I don't like the idea that people can stop me from walking on the beach. I understand the idea of protecting the clam beds and tidelands ecology, but I think people should be able to walk on the beach. If Manaco Beach can post "no beach trespassing" signs, than maybe our 300 feet of beach and community property should be valued by the Island County assessor at more than $13,250.00 (2005), today, $450.00 (2016). Somebody at manaco beach complained to the assessor, that our upland community area and beach were being taxed much more than other community areas and beaches. 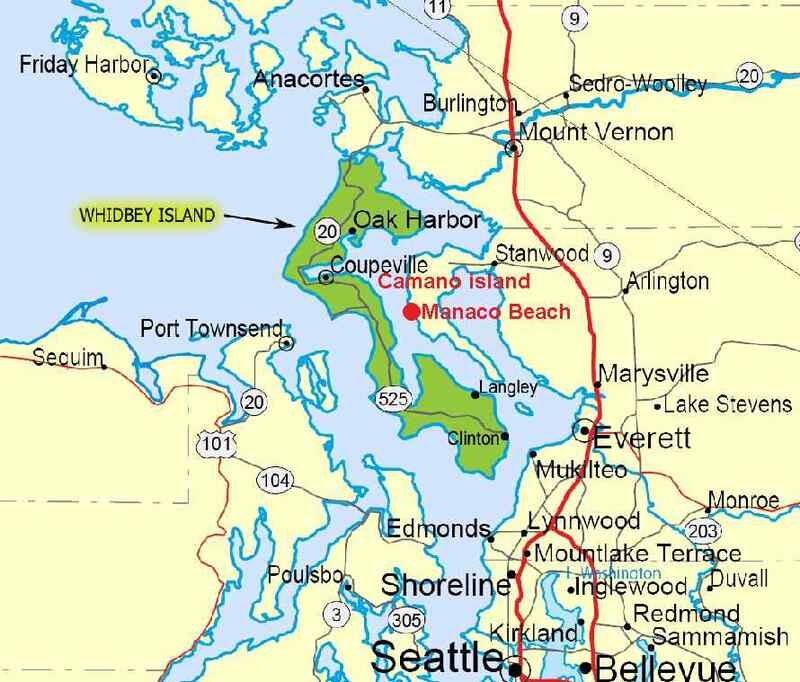 Manaco Beach and Camano Island, are in the center of the below picture. below is a plat map and beach information about manaco beach. manaco is 1/2 mile north of cama beach state park. The assessors mainly tax the view, not the private beach tidelands. 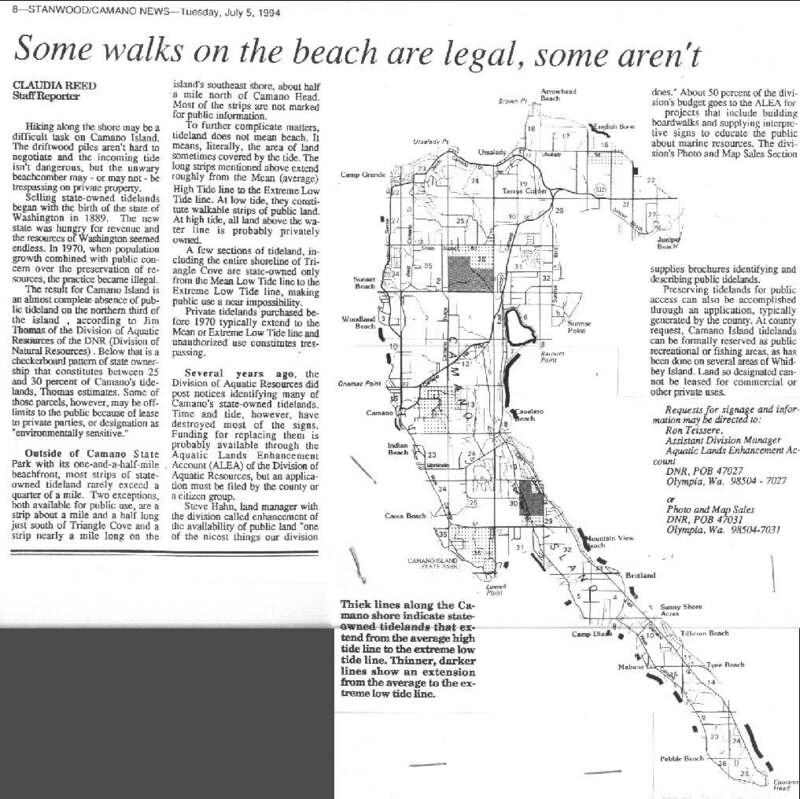 if the washington state courts, say no to beachwalkers, i think private beaches, should be taxed, as "very valuable" private property. Below is an article from the July 5, 1994 Stanwood/Camano News that gives some history of how tidelands became private property. The article says that "private tidelands purchased before 1970 typically extend to the Mean or Extreme Low Tide Line and unauthorized use constitutes trespassing." 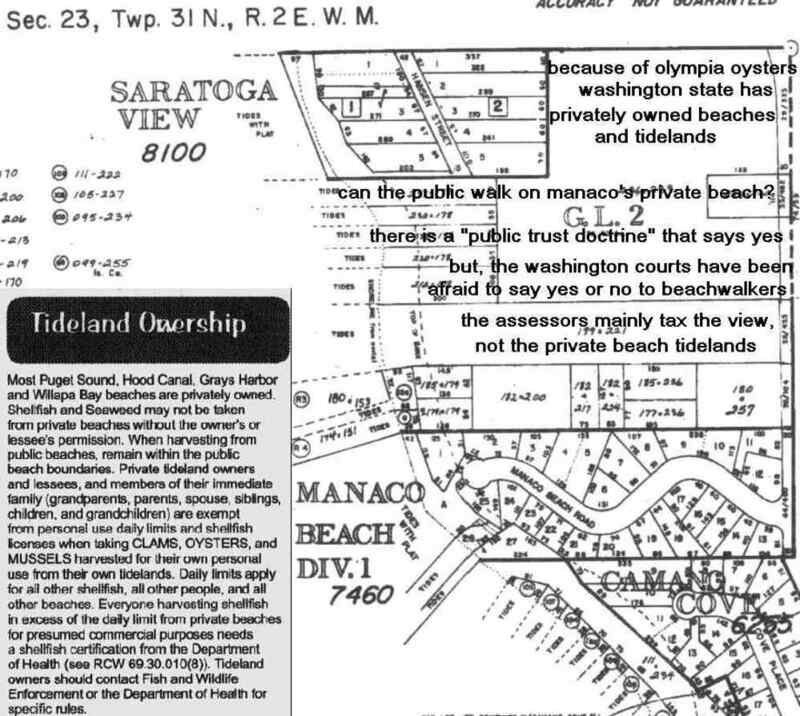 Below is the Island County Assessor 2005 data for the Manaco Beach community owned property which should include our tidelands.